It's only available to subscribers of LinguaTrek, so if you haven't subscribed please do so here! Of course, subscribing is completely free! You will receive instructions via email about how to download the ebook. If you are already a subscriber, these instructions are waiting for you in your inbox! I want to finish translating the ebook into Polish as soon as possible. If you are interested in helping with the translation effort, please send me an email! I'll be working on this over the weekend. I also plan to have EPUB and MOBI versions - for mobile ebook readers like the Kindle - ready soon. If you have an ebook reader and want to help test that my files work, please send me an email! 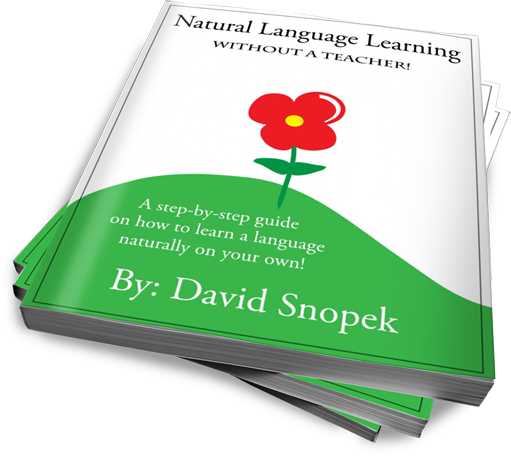 I hope you enjoy the ebook and find it helpful on your language learning journey! Please let me know what you think in the comments below! Great work! I'm on chapter 9 now (reading on my Kindle, it's converted quite well) and I have one question :) Do you plan an audio version (in English of course)? Thanks, I'm glad you like it! An audio version would be cool, but I don't have a plan at the moment. A number of people on YouTube requested one. But I don't have time at the moment to make one. That's awesome that it converted well to the Kindle! I'm going to make an official MOBI for the Kindle soon (maybe in time for the Polish release). It'd be great if you could help test it! In any case, thanks for the kind words and I wish you success on your language learning journey! Najlepszą częścią tej książki jest 10.1 My goal with Polish. Howdy David!!!! I have been reading your book for over two hours ( I should go to the pub, but this book is cool). I am going to study Nursing at Bucks University in High Wycombe and with your method I can achieve an Academic English. You make people happy, who learn English as a second language. I have to send an e-mail to a tutor from Wycombe College with your book. I am going to use this method like you learnt with Harry Potter. Your personal method based on the natural learning of language. I want to burn up my tekst books, which make me unhappy and kill my ability to learn English ;-) ;-) ;-). P.S I am going to burn up my boring tekst books tomorrow. I had pay before £ 60 for these books ;-(and did not help me. IIRC I’ve already told you. I read a lot of content of interest to me. Learnt words with audio pronunciation, hundreds or even thousands of them. My path wasn’t ideal at the beginning. Now, to make up for it, I listen a lot, about 1 hour a day. Comprehensible input is your key to success. You should have already known that to learn a language you don’t have to live in a country where the language is spoken. You have much more opportunity to immerse yourself, to pick up words and phrases living in the UK. Be more patient. It’s all about it. Great work David, I have just finished reading your ebook, it's not boring, even for constant-reader of your website! I need more....;) I have idea of great joke..as long as you will be able to record audiobook of this work, just tell in polish - "dzień dobry, tutaj przed >>mikrofonem<< dejwid snopek"!. Last but not least, You know, that english language is very popular what's more very helpful in searching job etc. Nowadays it is required to have certificate of english skill. For example - certificate in advanced english consists of really hard grammar as well as lots of dull vocabulary. What can you tell about it? It is my first comment here, but not first visit. P.S... I have some idea...i dream about speaking in German..but it's not necessary now. What would be better - improve my english skill more and more or try to learn german tongue from beginning? Anyway, if you have to take such a test, I recommend joining a course or hiring a tutor to help you prepare directly for that test, maybe 6 months in advance. It likely won't help your English ability much and you will probably forget most of what you learn afterwards - but it will help you pass the test. As far as German: that's up to you! It's easier to learn a second foreign language when your first is at a higher level. But my advice would be to just follow your motivation! If you're dying to start learning German now, just start! I'm so glad I've found your blog. I just subscribed u =) I moved from England to Poland,Gdansk months ago because I and my husband decided to do our own business here(he's originally Polish while I'm Thai). I'm just a Polish beginner now and I found that Polish is sooo difficult to me. Thank you very much for the ebook. You're amazing! Glad you like the ebook! Let me know how your Polish studies go! I'm glad you liked the ebook! Let me know how your Polish studies go - especially once you start reading Harry Potter! Thanks for reply, David. What's your next goal? Especially i mean themes of your next articles. P.S i have just started to read "Hobbit" in english language and i added lots of words to my Anki :). It's not my first english language book but first in your system. I print some pages and the next i underline unknown words, but i desire to order it. I'm actually not sure. I still have to recover from the ebook. ;-) But I'll probably publish something next Tuesday or Thursday! Ah, awesome! I read the Hobbit when I was a teenager. Let me know how it goes! Hi David,how are you? I'm brazilian and I really want to learn polish, I'm just a beginner, your blog is very good! greetings from Brazil :). Thanks for the comment. :-) I'm doing good. How about yourself? Thanks! That's a great idea about the Facebook like button. I'll add one when I have a chance! Hi David, Just subscribe to your site. I'm an English speaker living in Poland for 4yrs now and still can't speak the language, I sure hope your ebook can help me. Does BiblioBird help with Polish? I came here from an article about you at 'fluentin3months.com' and I have a question. I am a Brazilian who is going to Kraków in two weeks to stay there for 7 other weeks. The purpose is voluntary work. So, I want to know if is it possible to learn Polish, enough to have a conversation, in these next 9 weeks: from now to the end of my internship. I know basic German, and if there's considerable amount of German speakers, I could focus on practising my German instead, even though I don't know how would I be treated by Poles while talking German.